The March Island Batik ambassador challenge is "Vintage Reimagined." I waffled around for a while with what to make, mostly because I wasn't sure if my ideas were reimagined enough to fit the theme. 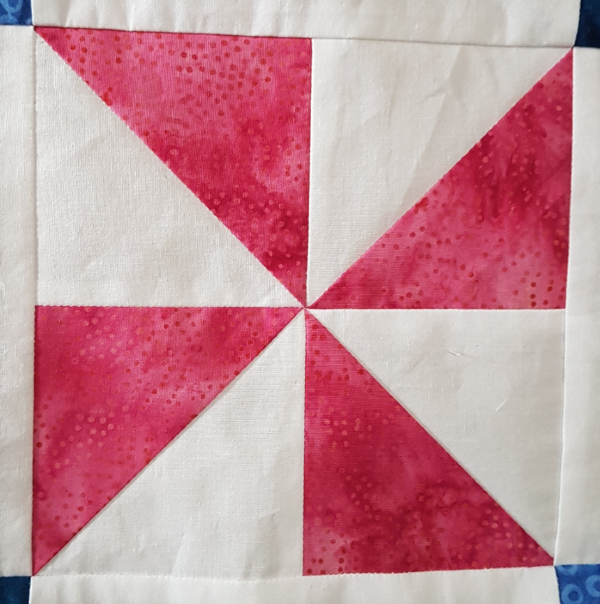 In the end, I decided to go with two of my favourite traditional quilt designs - a pinwheel block and a single Irish Chain. I used Island Batik's solid white for the background, in part because a white background is one of the things I think of when I think 'modern quilt' and in part because I knew the bright, clean white would show off the other fabrics so well. 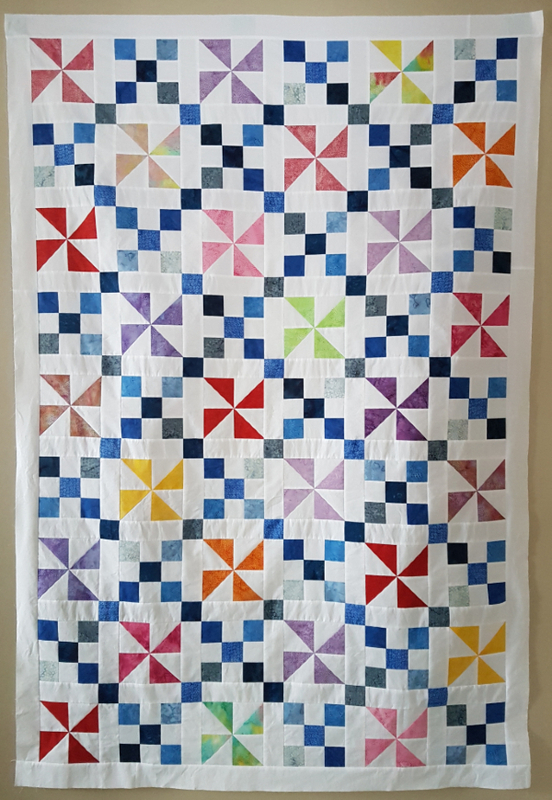 Here is my finished Pinwheel Irish Chain quilt top, which measures 50" x 74". The nine patch blocks and the sashing cornerstones that form the Irish Chain design are made with blues from the Foundations line. I love the depth of colour in these fabrics! 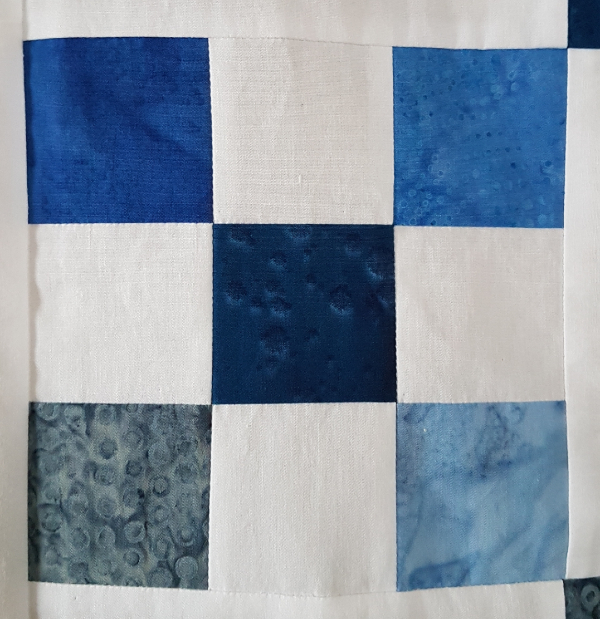 I used six different blues and strip pieced the nine patch blocks. 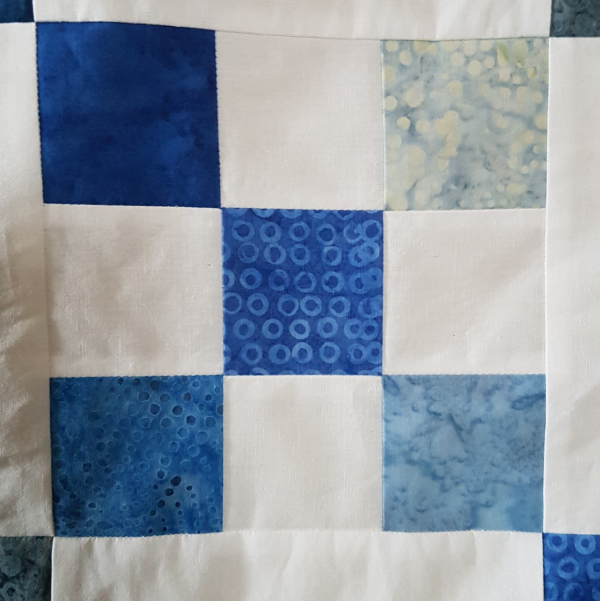 When it came time to lay everything out, I tried to keep the six fabrics separated, but I did notice that I ended up with one spot where two of the grey-blue squares are touching. Oh well, I'm not about to take it all apart now to fix it! The pinwheels are all made of Paisley Dot Brights and I love how cheerful they feel. Aren't they perfect for spring? This challenge comes at the same time as Sarah's Hands to Help Comfort Quilt Challenge, so this quilt top is my contribution to her fabulous comfort quilt drive. There's a Canadian charity included this year, Victoria's Quilt's Canada, which provides quilts to people with cancer, and that is where I'll be sending it. They specifically ask for quilt tops only and they say their greatest need is for adult sized ones that are approximately 50" x 70". Very pretty, Leanne, and sure to bring comfort to someone at a stressful time. It looks great. So bright and cheery. Terrific quilt; you're right those paisley dots are just the best, and perfect for cheery days in spring, wind and all. Great idea to donate it to the Canadian charity. I need to make them one this year. I have one cut out of flannel charms, just need a background flannel and I can get sewing. 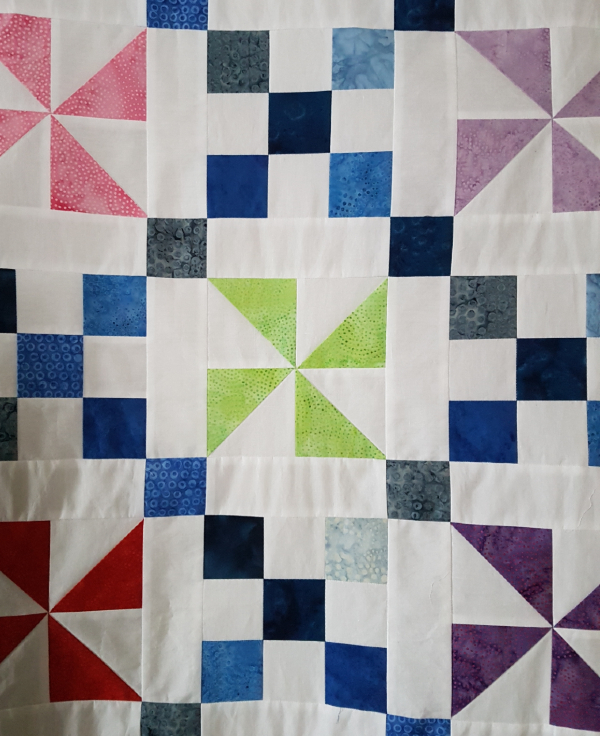 Super colour choices and a great layout that shows off the pinwheels against the patch blocks. Blues, my favourites. 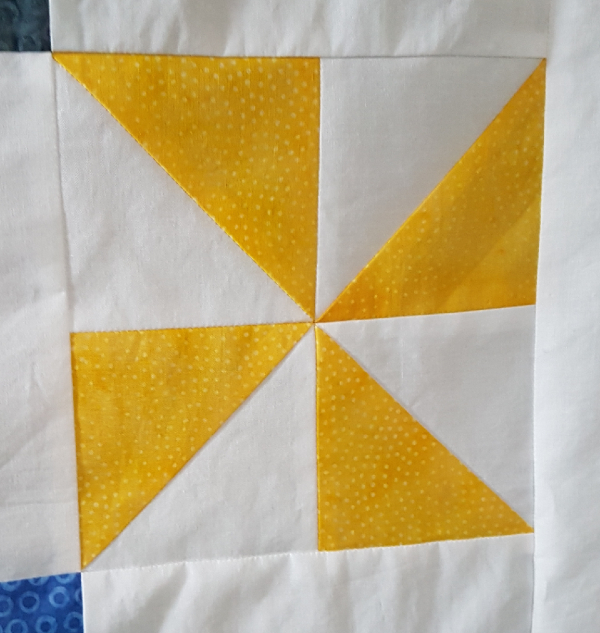 Pinwheels are my favorite blocks, and together with the Irish Chain it is spectacular! The sun being up longer is a huge positive side! What a fantastic quilt to donate for the Comfort Quilt Challenge this year, too. Very pretty and colorful. Your quilt top makes me smile. 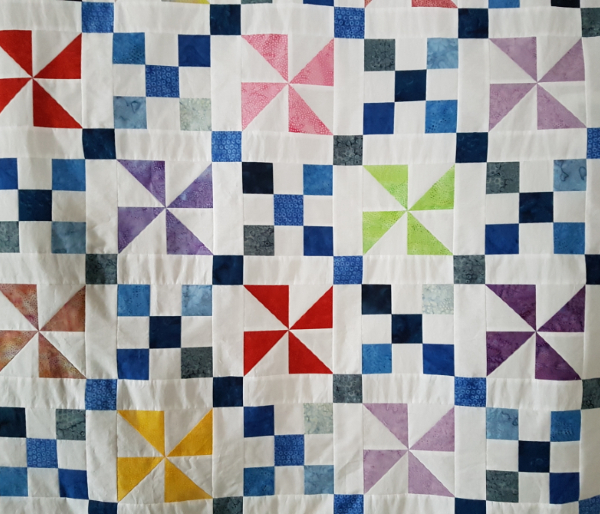 Lovely quilt Leanne, combining the two blocks for the challenge was inspired! Beautiful quilt top! Do you wash your batiks before you use them? I've had color bleeding a few times, so I am way of batiks. I love the Paisley Dots fabrics - and all their bright and cheerful colour! That will be a great quilt for Victoria's Quilts! Would I Be Willing to Do This?